So any mundane task that can be done without the children (for instance, going to the grocery store) is like a vacation. You don’t have to worry about whining, relentless begging for various snacks or foods, numerous requests to visit the gold fish in the pet section of the store, or checking out the toy department (“I just want to SEE the toys, mom. I won’t ask for anything…I promise!”) You get the idea. When my brother offered to watch my kids for a couple of hours last Saturday, I jumped at the chance to shop at the new Trader Joe’s in my area. I hadn’t been to a Trader Joe’s since I moved away from Northern Virginia over 7 years ago, so I was really excited. As I approached the market, I was pleasantly surprised that the small parking lot had a number of spaces readily available and the store wasn’t as jam-packed as previously reported. This was my lucky day! The doors opened and I immediately noticed the air-conditioned laced aromas of fresh bread and fruit in the air. A smile crept across my face. It was such a treat to peruse each aisle, eyeing all of the merchandise, actually being able to take my time and read labels and taste various samples. I felt so incredibly happy at that moment that I actually posted it on my Facebook page. Pathetic, huh? I only purchased a few items, including a bottle of Cocobon California Red Wine. Check out this description on the bottle: “We’ve blended fine California red varieties to develop a rich and silky wine, with just the right hint of sweetness. Enjoy aromas of ripe cherries as well as heady waffs of mocha that will fill your senses.” Now how could I resist? When I got home, I spent the last 30 minutes of my freedom enjoying two of my Trader Joe’s purchases: a small spinach salad and a glass of the smooth, savory wine. My two-hour alone time, albeit brief, was just the mini-vacation I needed to get back on track. 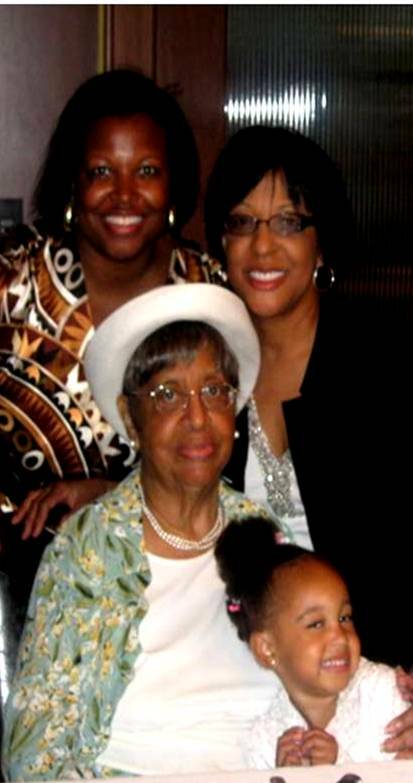 Four generations: A photo of my grandmother, mother, daughter and me at a Mother’s Day luncheon in 2009. Today would have been the 90th birthday of my grandmother, Mary Margaret Adair Woods. Our beloved queen and matriarch was called home to be with her Heavenly Father on Sept. 3, 2011, and not a day goes by that I don’t miss her or wish I could pick up the phone and hear her voice just one more time. As my 7-year-old daughter knelt at her bedside, she said “Dear God, today is my Mammaw’s birthday. Please tell her happy birthday for me and that I love her.” A sob caught in my throat but then I immediately praised God that my children will always have wonderful memories of her. What a blessing! Happy birthday, Mammaw! We love and miss you but know you’re in heaven having the biggest celebration of all surrounded by your mother, father, siblings and other family members, friends and loved ones.